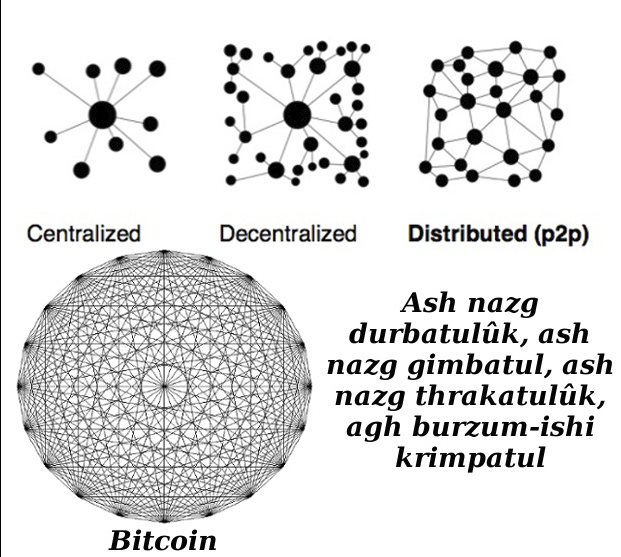 Bitcoin is one network of nodes that tends toward a complete graph, not many networks. DSV is the most recent argument to have embroiled the Bitcoin (BCH) community. The arguments have centered around whether or not DSV is a subsidy and whether or not the calculations for DSV should be done with loops which is cheaper, or through unrolling which costs more. The problem is that neither side is addressing the real issue, in fact the side arguing DSV is a subsidy is simply mistaken. Their mistake is understandable because they don’t understand what DSV is meant to do and as such they interpret it incorrectly. DSV, but more specifically Extended Bitcoin Scripts subvert the main chain and change the role of the full nodes (miners). When Ryan Charles says DSV is a subsidy he is assuming that ABC wants to keep everything on the Bitcoin blockchain. However if you read Andrew Stone’s writing on the topic, the method for creating loops and other OP codes without hard forks is by creating a new network of nodes upon which complex scripts are calculated and then fed back to the Bitcoin nodes (miners). This new network of nodes opens up drive-chains and various other methods for connecting decentralized networks. The reason these EBS nodes can’t be subsidies is that in order to be a subsidy all must pay for something only a few use. But Bitcoin’s full nodes (miners) don’t pay for anything, everything is done on a new set of EBS nodes. Though most on the DSV side might think that if DSV isn’t a subsidy this leaves no reason to oppose it, this is entirely untrue. DSV, implemented through EBS, moves data off the main chain. What backs Bitcoin is the data on-chain. Segwit fractionalized the Bitcoin blockchain by removing transaction data from the blocks and onto a new network of nodes for efficiency reasons. EBS tries to do a similar thing when it moves the calculation of script to a new network of nodes for efficiency reasons. Additionally both take work and fees from the miners thus reducing the role of the miners within Bitcoin. It must be noted that EBS is not a system of fractional reserves like Segwit’s version of Lightning because the computation done on EBS nodes is not erased, it is still fully done and stored, just on a new network of nodes. However, depending upon the rule sets of the EBS nodes and how they store and prune data this can change in the future. This is what terrifies me about EBS, instead of only having to trust miners to validate transactions and blocks according to the Bitcoin protocol which harnesses their greed, now we have to ensure the EBS nodes are operating correctly as well. If drivechains are implemented, how many different node networks must we understand in order to trust that we can use Bitcoin safely? Why on earth would I prefer trusting thousands of decentralized networks instead of one? Furthermore, isn’t against the Bitcoin whitepaper to introduce a new set of nodes to validate transactions or transaction data? Bitcoin has miners and ANY of these miners can validate ANY transaction. With the introduction of EBS nodes this isn’t necessarily true anymore. Can the EBS nodes censor certain individuals trying certain types of transactions just like the secondary network of Lightning nodes can censor on their networks? None of these questions have been addressed. In fact, ABC seems to have silenced and blocked so many people they think that there is agreement on the opposing side. But the subsidy issue is a moot point, it is the fundamental change to the role of miners that the introduction of the EBS nodes cause that makes me oppose ABC in this fork. The final point I want to make is that the purpose of ABC’s fork seems to be for the creation of Ethereum style ICO assets. My initial response to DSV was that it added only scam style ICO’s with no real value. So beyond what Extended Bitcoin Script does to the fundamental working of Bitcoin, it also introduces more scams to Bitcoin which are a net negative. I sincerely see no reason to adopt this path and think DSV should never have been considered as a serious change to the Bitcoin protocol. Please quit acting like this is something the community wants. It is not.